Starting with a forfeit at 125 pounds for Chase Poston (freshman, Olympia, Wash.), Central won the first nine matches of the night, including four pins, a technical fall and a major decision. 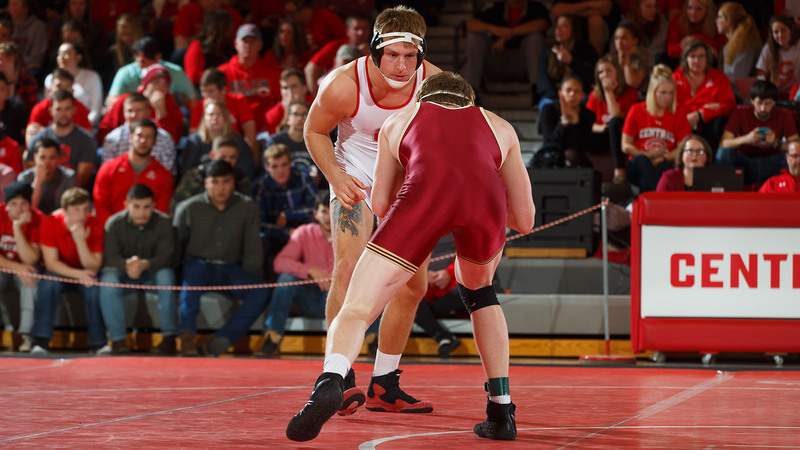 A four-bout streak of pins started at 165 pounds with Jeremy Vester registering a fall at 4:01. Nathan Fritz (junior, 174 pounds, Sigourney), Griffen McBride (sophomore, 184 pounds, Pleasantville) and Gavin Babcock (sophomore, 197 pounds Altoona, Southeast Polk HS) all needed less than two minutes in the first period to pin their opponents. Babcock is now 7-0 on the season, including four wins by fall in the first period. Central also got a 20-5 technical fall win from Cam Timok (senior, Glen Allen, Va. Hermitage HS) at 133 pounds and a 10-1 major decisison from Collin Groleau (junior, Peru, Ill., LaSalle-Peru Township HS). “The MSOE Invitational will be tougher than it’s ever been,” Van Kley said. “We’re going to get a great challenge. It’ll also be good to get some of those younger guys some matches before Christmas at Buena Vista.